SharePoint Server is a web-based collaborative platform that integrates with Microsoft Office. Because documents are constantly being created, modified and deleted across your SharePoint environment it is vital for security and usage reasons to track who has access to what documents and who modifies them, as well to understanding SharePoint access permissions and know who modifies them. See the best SharePoint reporting tools that will help you get the comprehensive SharePoint monitoring you need. Power BI is a suite of powerful data visualization tools for analysts, business users, IT and developers. It represents information graphically to facilitate analysis, data modeling and reporting. Power BI has built-in connectors for multiple services and databases that enable you to ingest available data in a matter of minutes and build consolidated reports and charts. 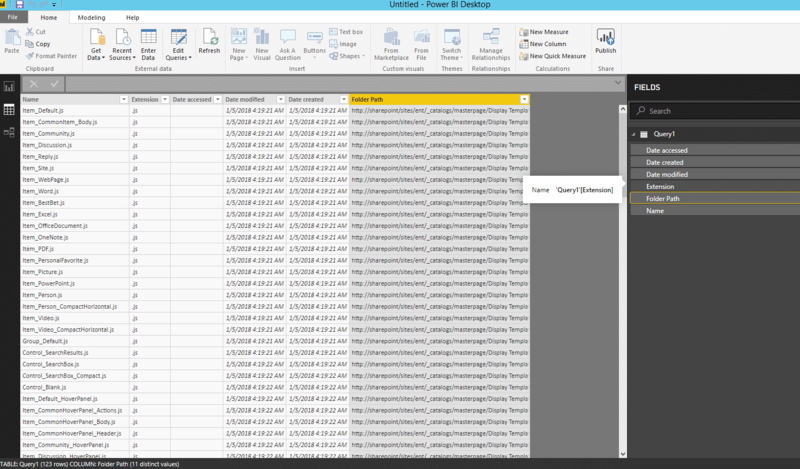 About 65 different sources of data can be integrated into Power BI; for example, you can pull all log data directly from your SQL Server database or prepare and analyze it in a way familiar to Excel users. Power BI is free. Yes, there’s a Pro version that enables users to present more data, but you should be ok with the free version for most of your reports. Installation is very fast and simple, but it requires a Microsoft account. The interface is clear, but you will need to read some guides in order to start making reports from SharePoint. The bad thing is that there are no out-of-the-box reports or dashboards; you have to run PowerShell scripts to export the information you need into CSV and then import it into Power BI. All in all it is a nice tool for visualizing your log data. HarePoint Analytics reports save considerable time in incident investigation. Unlike audit logs, they immediately give generalized statistics in tabular and graphical form, so you can identify suspicious user activity without additional data processing. Together with the data concerning site visits, these reports also enable you to investigate document misuse or other malicious activity by users and identify the computers where those actions took place. Installation is very fast and easy, but you should configure the product in your SharePoint web interface. 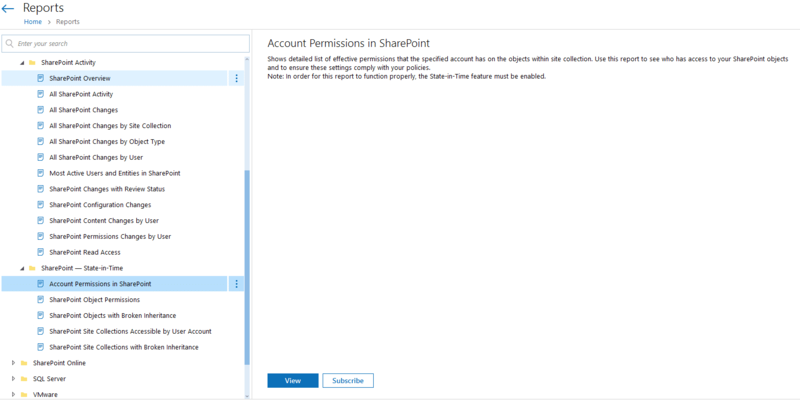 It integrates into your SharePoint configuration settings and is available only from the SharePoint administration center. All reports and dashboards can be exported to PDF or CSV or sent via email. CardioLog Analytics is a great software tool for optimizing your site to make navigation, design and content better for users. It can also audit content modifications, additions and deletions, giving IT administrators a clear view of who manages which content and how. You can also get a clear picture of what types of content are used on your SharePoint and their size. Beyond web analytics, CardioLog Analytics provides a complete engagement tool, Voice of Customer. This tool helps organizations engage with their audience using surveys and message bars. The installation wizard needs the latest .NET Framework to run, which forces you to install specific updates from the Microsoft update website. These updates require some time to install and will force you to restart your server few times. This may cause some frustration, but after the installation is complete, the CardioLog analytics wizard will smoothly drive you through the configuration process. Then you will have access to all reports and analytics, but of course, some time must pass before you get results in the reports. CardioLog Analytics has a 30-day free trial, which is more than enough to get familiar with the product. This SharePoint reporting software solution alerts and reports on SharePoint changes, such as changes to farm configuration, user content, user permissions, group membership and security policies. It provides all the details IT administrators need for auditing SharePoint, including who made each change, when and where each change was made, and the before and after values. IT administrators can use the Interactive Search feature to quickly investigate a particular change and create a report that they can use in the future. They can also create alerts in order to get email notifications when the alert is triggered. 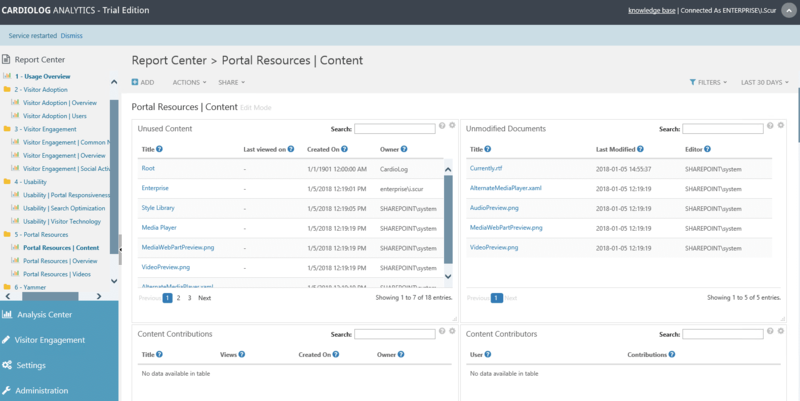 Netwrix Auditor for SharePoint also provides state-in-time reports on SharePoint object and account permissions, objects with broken inheritance, modifications to permissions and permission inheritance, group membership, and security policies. IT staff can subscribe to any report to be delivered automatically by email to facilitate regular review. Those reports use SQL Server Reporting Services to run, so you need at least MS SQL Express edition. Netwrix Auditor for SharePoint eliminates the problem with audit log trimming by storing audit logs in a two-tiered storage for more than ten years. The installation process is very fast and smooth. Configuration is so simple it can be performed without even reading the documentation (but I advise you to read it first anyway!). Netwrix Auditor for SharePoint has a 20-day free trial, during which you can easily explore all its features. There is also a free version of this product, Netwrix Auditor for SharePoint Free Community Edition. Though its capabilities are limited, you can get a daily report on all changes to your SharePoint farm during the past 24 hours, including the details about when and where each change was made. Another tool for getting SharePoint reports is Microsoft PowerShell. Of course, this option requires that you be familiar with PowerShell cmdlets and scripting. 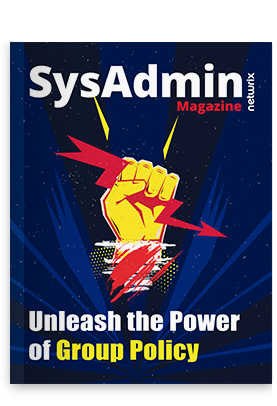 You can run PowerShell using either the SharePoint Management Shell or the PowerShell ISE. However, the latter is much more convenient. Among all these SharePoint reporting tools, PowerShell has the most flexible reporting capabilities — but it is very hard to learn and you’ll need to invest a great deal of time to create, run and maintain the scripts needed for the unique needs of your SharePoint system. If you are not a PowerShell and SharePoint guru, you might want to consider investing in one of the third-party SharePoint reporting tools described here, so you can set up SharePoint reporting as soon as possible and quickly start using out-of-the-box reports and analytics. To determine which solution best suits your business needs, start by determining exactly what you want visibility into: usage statistics; business statistics; or changes, data access and user permissions. What SharePoint reporting tools do you use?